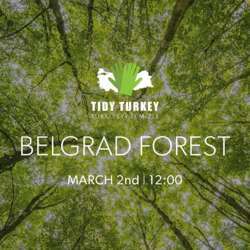 You must be a member of the Istanbul Changemakers Group to attend this activity. Would you like to join this group? Hello everyone, I'm so excited to announce our first Clean Up for Protected content . Let's celebrate International Women's Day whilst helping to spruce up the world's First Lady, Mother Nature. Let's walk or "plog' in beautiful Belgrade Park, collecting trash as we go. Following the clean up we will have a 'pot luck' picnic in the park or there is food available for purchase at the park's cafes. Please wear green or blue so we can be identified as a group and as usual, dress for comfort and the weather. from Taksim - Taksim - ITU Agazaga Protected content then bus 59RK (11.27am) to Bahcekoy Merkez. or bus 42T along the Bosphorus route via Besitas, Ortakoy etc. for route details or check Trafi Istanbul transport application for your own transport needs. Please check the timetable in advance. I hope to be on the 10.36am at Kabatas Erkek Lisesi stop arriving at the final stop outside the park at BAHCEKOY at 11.27am. Let's start a new Clean Up season off with new enthusiasm full of fun and friendship.